Real Name: Jim "Jimmy" Hudson, Jr.
Powers/Abilities: Jim has training in first aid, law enforcement, firearms and hand-to-hand combat such as judo. He usually carries a billy club, flashlight and whistle, but also uses a Smith and Wesson .38 pistol. History: (Police Badge #479#5 (fb)) - Jim Hudson grew up in Manhattan. As a child, Jim would play around on the docks with friends like Ernie Mundo. Jim's father was a policeman and Jim hoped to follow in his father's footsteps. However, Ernie only hoped to make money. Returning home one day, Jim found his father in a quiet mood; his father explained he had just arrested Charley Mundo, Ernie's older brother. Jim told his father he wanted to be a policeman like him and his father encouraged his ambition. Years later, while Jim was in high school, he came home one day to learn his father had responded to a warehouse robbery and captured the men responsible, but the strain on his heart caused him to suffer a fatal heart attack. His father's death only served to make Jim's determination to follow in his footsteps stronger still. After coming of age, Jim entered the police force. He took courses in first aid, traffic procedure, laws, interpretation of laws, marksmanship, judo and body contact defense. Jim finally graduated from his studies and was assigned to Precinct 23, the same sector his father worked in. 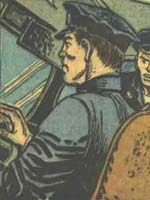 Given badge#479, Jim was assigned the night beat from 30th street to the docks; Barney Simms was also assigned to his beat. (Police Badge #479#5) - On Jim's first night, just as he was about to rendezvous with Barney at the halfway point of their beat, he heard Barney's whistle. Speeding to Shafer's grocery store, Jim found Barney, who showed him Mr. Shafer had been roughed up by a robber. Barney winged the robber as he fled, but the robber escaped. While Barney stayed with Shafer and called an ambulance, Jim set out on foot to pursue the thief. Jim traveled down the docks and decided to check the area beneath the docks where he had played as a child. Venturing below, Jim found himself face-to-face with the thief: his former friend Ernie Mundo! Ernie asked Jim to let him escape, but Jim refused and drew his gun on him; Ernie was unable to shoot his former friend and turned himself over to Jim. Ernie was sentenced to ten years in prison and Jim would think of his ex-friend while patroling his night beat. (Police Badge #479#5/2) - One night while on night beat, Jim found Johnny Craith about to be struck by a car on the 30th street bridge. Jim saved Johnny, but finding Johnny was upset and claiming someone would "get" him, Jim brought Johnny back to the 23rd Precinct station. At the station, Johnny confessed he had been working at Webster's garage, helping to repaint stolen cars. Having only just found out the cars were stolen, Johnny ran away, but feared Webster and his associates would try to kill him. Jim helped convince Johnny to give his testimony, even though Johnny didn't know the identity of Webster's boss. With Johnny's confession, Captain Brady led a raid on Webster's garage with Barney and Jim accompanying him. Fred and Webster defended the garage against the police, but Jim overcame them in a gunfight. when Webster exclaimed that a departing car belonged to their boss, Jim pursued the vehicle and shot out a tire, causing it to crash. Jim pursued the occupant into the subway and found the boss was Prentis, a used car dealer. Jim caught Prentis in the subway and brought him back to the station, ensuring the car theft ring was broken up. with an hour left on his beat, Jim returned to the streets. 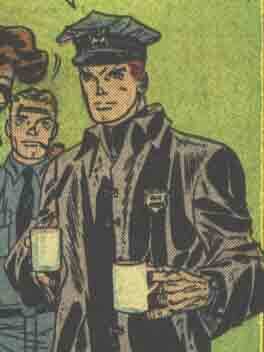 (Police Badge #479#5/4) - During Jim's night beat, he saw Mike De Horst shot by an unseen gunman. On Mike's person Jim found a diamond; although Mike survived the gunshot he was unconscious and murmuring "ice, water, Judas!" Jim wondered at the meaning of Mike's words. At the station, Mike's employer Van Kroot identified the diamond as one from his store. In the early hours of the morning, Jim went off duty and returned home, still wondering at Mike's words. The next night, Jim patrolled the diamond district and heard a gunshot, but found no one; wondering if it were a ruse, Jim raced to the docks and found a ship coming up, loaded with armed men. Grappling with the crew, Jim found they were smuggling jewels. With the help of Barney and a police boat, the crew of the ship were rounded up. 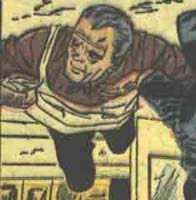 Hearing Mike had revived, Jim raced to the hospital to see him, arriving just in time to prevent Van Kroot from killing Mike with a gun. Jim had realized the "ice" referred to diamonds, "water" to the smugglers' boat and "Judas" to Van Kroot, which Mike confirmed, explaining how he discovered Van Kroot's scheme. As Jim's shift ended in the early hours of the morning, he bade farewell to Captain Brady and went home. Comments: Created by an unidentified writer and Don Heck; note that the cover and 4th story of Police Badge #479 were drawn by Joe Maneely; because covers are frequently created before their contents and Maneely was Stan Lee's favourite artist, Maneely may possibly have had a hand in Hudson's creation. Note, however, the cover gives Jim blond hair rather than the correct red colouring. The series Police Badge #479 inherited its numbering from Spy Thrillers; issue #5 was actually the 1st (and ultimately only) of the series. 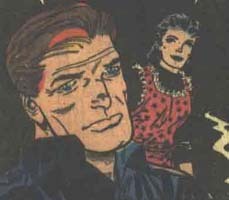 Given there was only one issue of Police Badge #479, I wonder if other adventures of Jim Hudson were completed, but released in other titles, possibly with his name changed; if you see any Don Heck police stories in late 50s Atlas titles like Tales of Justice, give me a holler! In case you're wondering, Police Badge #479#5/3 doesn't feature Jim Hudson. Jim Hudson looks like this unnamed cop in the Burglar Who Walked Thru Walls story. Jim Hudson, Sr. was a police officer assigned to Precinct 23 under Captain Brady. His son idolized him and eventually followed in his footsteps. 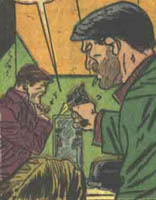 In the course of his duties, Mr. Hudson once arrested Charley Mundo, older brother of his son's friend Ernie. One night, Mr. Hudson responded to a warehouse robbery and single-handedly caught the thieves, but suffered a heart attack from the excitement and died. Mrs. Hudson continued to support Jim as he grew to become a policeman; Jim still lived with Mrs. Hudson. 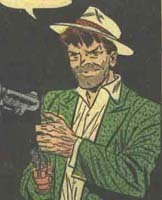 Ernie Mundo was the younger brother of Charley Mundo, a small-time criminal. Ernie idolized his brother, even as he was friends with Jim Hudson, Jr., a policeman's son. Charley was eventually arrested by Jim's father. As an adult, Ernie became a criminal like his brother. Ernie robbed Mr. Shafer's store, but Barney Simms arrived and shot him, winging him in the right arm. Ernie fled to the docks and tried to hide where he once played with Jim, but Jim was the patrolman on that beat and found Ernie where he was hiding. Ernie tried to convince Jim to let him leave, but Jim refused; unable to shoot his friend, Ernie surrendered. Ernie was sentenced to ten years in prison. Captain Brady was Jim Hudson, Sr.'s superior officer at Precinct 23 and informed the Hudson family of Jim Sr.'s death. When Jim Jr. graduated into the force, he was assigned to Brady's precinct and Brady gave him the night beat from 30th street to the docks. Brady entered the field to personally lead the raid upon the car thief ring being operated by Prentis. Brady also witnessed the exposing of Van Kroot as an international jewel thief. Barney Simms was the patrolman assigned to the night beat with Jim Hudson from 30th street to the docks; the two men would meet each night at the halfway point of their beat. Barney clashed with Ernie Mundo when he robbed Shafer's store, shooting Ernie in the arm as he fled. Barney also helped round up the car thief ring being operated by Prentis and aided Jim against the Van Kroot diamond smugglers. Barney's hair colour is a minor mystery; it changes from blond to brown in the course of the 4th story! Anyway, it was brown in the 1st story. Mr. Shafer ran a grocery store near the docks. When Jim Hudson was a child, he would give Jim candy. One night, Ernie Mundo robbed Shafer's store and beat him up. Barney Simms arrived in time to drive Ernie away and called in an ambulance for Mr. Shafer; Ernie was subsequently captured by Jim Hudson. 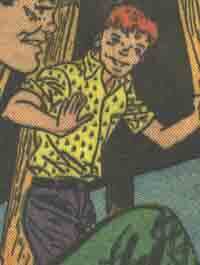 Johnny Craith was a young member of Prentis' car thief ring, helping to spray paint stolen cars. When Johnny learned the cars were stolen, he fled from the gang and encountered Jim. Johnny told his story to Jim; although Johnny had never met Prentis, his testimony helped the police raid the operation and expose Prentis. Prentis was a used car dealer who secretly ran a car theft racket, having his men Fred and Webster arrange to repaint cars so he could sell them on his lot. Publicly, Prentis pretended to be outraged by the thefts and feigned working with Captain Brady to stop them. When the police raided Webster's garage while Prentis was there, Jim Hudson pursued Prentis' car and captured him in a subway tunnel as he attempted to flee. Prentis was arrested. Fred (left) and Webster (right) were criminals working for Prentis. From Webster's garage, they took stolen cars and had workers such as Johnny Craith repaint them so Prentis could sell them on his lot. After Craith informed on Webster to the police, Webster's garage was raided. Fred and Webster tried to fight back with their guns, but patrolman Jim Hudson outfought them and both men were arrested. Mike De Horst was a diamond cutter in his youth, but age took its toll on his hands. Mr. Van Kroot took pity on Mike and kept him employed as a night watchman. 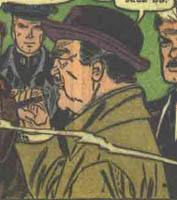 However, Mike suspected Van Kroot was a diamond smuggler and went to work for him in the hopes of exposing him. Recognizing one of Van Kroot's stones from the Royal Crown of Dusseldorf, Mike tried to alert the authorities, but Van Kroot caught Mike and shot him. Mike was found by patrolman Jim Hudson with the diamond in his hand. Mike stammered out "ice, water, Judas" in the ambulance, which Jim eventually realized meant the "ice" (diamonds) were coming by water and Van Kroot was a "Judas." Although Van Kroot tried to frame Mike as a robber, Jim eventually exposed the plot and saved Mike in the hospital when Van Kroot tried to kill him. Mike made a full recovery. Van Kroot was a European criminal who ran a diamond smuggling ring; amongst the jewels he obtained was a diamond from the Royal Crown of Dusseldorf. Van Kroot allowed Mike De Horst to come work for him as a night watchman, but Mike suspected Van Kroot was a criminal and recognized the royal diamond. Van Kroot shot Mike down; although Mike lived, Van Kroot hoped to frame Mike as a criminal. However, patrolman Jim Hudson ultimately realized the truth of the matter and rounded up Van Kroot's gang. Van Kroot tried to murder Mike in the hospital before he could awaken, but Jim arrived in time to stop Van Kroot and arrested him.